It’s often all about the girls, so today I’m kicking off a series of posts specifically aimed at the guys – including tips for style, grooming and skincare, stag parties and wedding survival tips. Today we are looking at menswear looks inspired by the catwalk shows, for the groom who wants to be stylish and unique (without looking like a member of One Direction). Up to now, especially in Ireland, the easy choice has been for the groom to head to a formalwear rental store with his band of merry groomsmen, pick out a typical three piece suit and a cravat that somewhat matches the bridesmaids. To this we say “no more!”. Be individual, be stylish. Don’t settle for anything less than perfection. Yes, velvet, but in a good way. Dolce & Gabana models strode down the runway at the autumn/winter 2015 shows in opulent velvet suits in shades of onyx, plum and midnight blue, combined with crisp shirts in muted shades and silk ties in subtle paisley patterns. The overall look is elegant and expensive. A rise in rustic and vintage styled weddings calls for suitable suits. Tweeds jackets and waistcoats combined with creamy shirts and whimsical ties or bowties are on trend. Finish the look with a natural boutonniere of berries, herbs and leaves. For this style, vintage is a good place to start, or try Hackett for the designer look. The denim-on-denim look is hard to pull off, but Ralph Lauren have made it work. 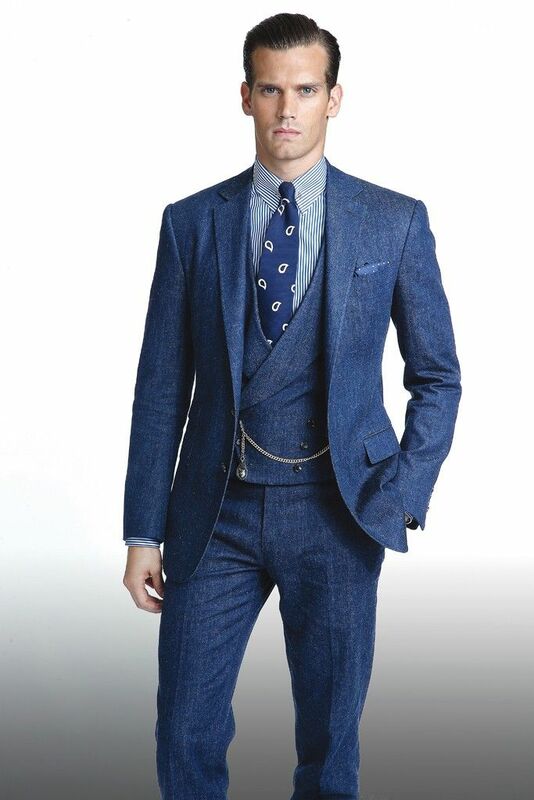 This three piece suit combined with a brass pocketwatch looks perfect without being pretentious. Black, grey, charcoal, navy…sound familiar? These are the go-to colours for 99% of grooms. There has been a swing in the direction of blue lately, combined with tan shoes, however this need not be the only foray into colour that grooms take. Dolce & Gabana, Marc Jacobs and Brioni provided us with dashes of stunning jewel coloured suits and tuxedos – a word of warning though, I would not condone wearing these without socks! Step away from the formal three piece suits, tuxes and cravats toward a more relaxed look – perfect for a wedding abroad or outdoors. If you are a groom who doesn’t like the idea of dressing too formally in everyday life, don’t feel that you have to do so on your wedding day. Bear in mind the overall style of the wedding though – a shirt without a tie and linen trousers won’t work for a black tie affair in a castle.